What should you look for in a doctor when looking for a new doctor or thinking of switching doctors? * The number one thing according to research is finding a doctor that you can trust. Being open and honest with a doctor about possible symptoms is the best way to get treated. * Ask for recommendations from family, friends, neighbors or even online Facebook groups. * Some of the best hospitals attract the best doctors. Ask around! * Make sure your doctor is board certified in the area you are needing help for. Need to see an OBGYN but a doctor is only certified in Oncology? You may want to start somewhere else first. * Check your insurance and see where you ARE covered. You may have to switch insurance plans to see the doctor you want! * Access your state's official Web site. In more than 40 states you can obtain information about a doctor and any claims that might have been filed against him. Start by clicking onto a state's official Web site to find out where to go next. * Some doctors offer samples from drug reps more than other doctors. This can be very helpful if your insurance does not pay for an RX or you have no insurance! "During my pregnancy I learned my previous doctor retired, leaving a replacement. I didn't even think twice about seeing the new doctor. Right off the bat, I felt something wasn't right. My new doctor was treating me like I was high-risk because I was diabetic. Testing here, testing there - with new tests wanting to be performed every week! I asked on a local Facebook group for moms about this doctor and asked for suggestions on doctors that could handle my "situation" without all the testing. I was referred to an amazing group of midwives (which I would have never considered myself). The testing that the previous doctor was wanting to do was in fact, overkill. 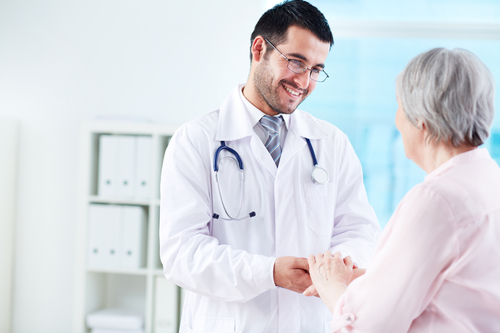 I am able to talk to my doctors freely and have a great relationship with them. It's really changed the way how I thought this pregnancy was going to go!" Having a good relationship with your doctor means everything. You know your body best. And when searching for answers, whether it be a second/third/fourth opinion on a possible diagnosis, don't stop until you find what you are looking for! What are your suggestions for our readers for choosing a new doctor?